There are a lot of ways to track your finances using your smartphone. 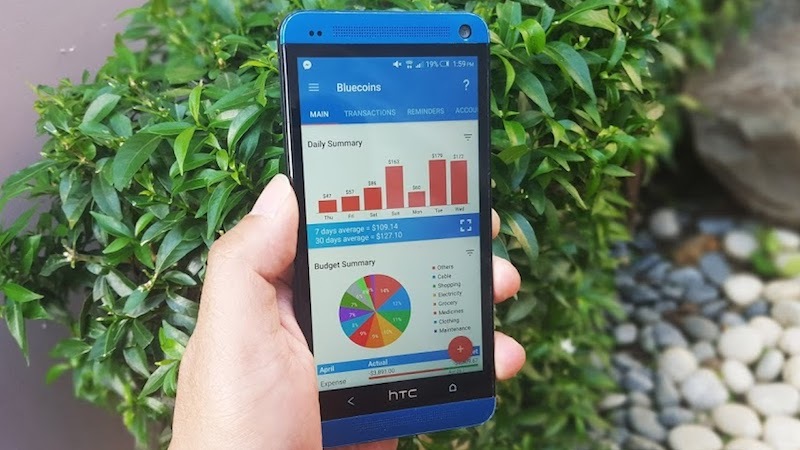 Expense diaries that let you log your spending are nothing new, and they come with a number of financial planning features including analytics that make them quite useful. I've personally become very reliant on apps that automatically track your spending by reading bank SMS updates, and these are really a great option. Then I had to travel out of the country for a while without international roaming, and that meant no more SMS updates, rendering the automatic tracking featured useless. Instead, I realised I had to manually track every spend, and that's were things started to get a little complicated. Especially because my spending was happening in both dollars and rupees, using a mixture of cash, a forex card, and my debit card. It became hard to properly keep track of everything in multiple currencies with the apps I had been using already. Hence began my search for a new expense tracking app and I had a few requirements in mind. First, the app had to work offline since I didn't have Wi-Fi everywhere I go. Second, it had to support entries in multiple currencies - if I make a payment to the local burger store in dollars using cash, then take an Uber and pay the fare using an Indian debit card so I am charged in rupees, and then watch a movie where I pay through my forex card, paying in dollars again, I should be able to track it all together. Reconciling this into a single account manually is confusing and the app should be able to handle this. Finally, I wanted an app that looks good, is easy to use, and provides useful analysis. I tried using the various money tracking apps that we had tested in the past to see if any had updates that met all three criteria. After that, I tried out a number of newer apps as well. After about a week of testing, and juggling multiple expense tracking apps, I finally found a favourite - Bluecoins. Although I really liked Bluecoins, it's important to point out that it isn't the only app that I found useful, and if it's not the right one for you, then there are a few others you should try out. Some of the other contenders are Pocket Expense (Android | iOS), Toshl Finance (Android | iOS), and Expensify (Android | iOS), all with their own pros and cons. That said, here's why Bluecoins has become my top pick, and is going to be my go-to application for tracking spends while I'm traveling (and perhaps even afterwards). The first thing that I noticed about Bluecoins is how simple it is to use. 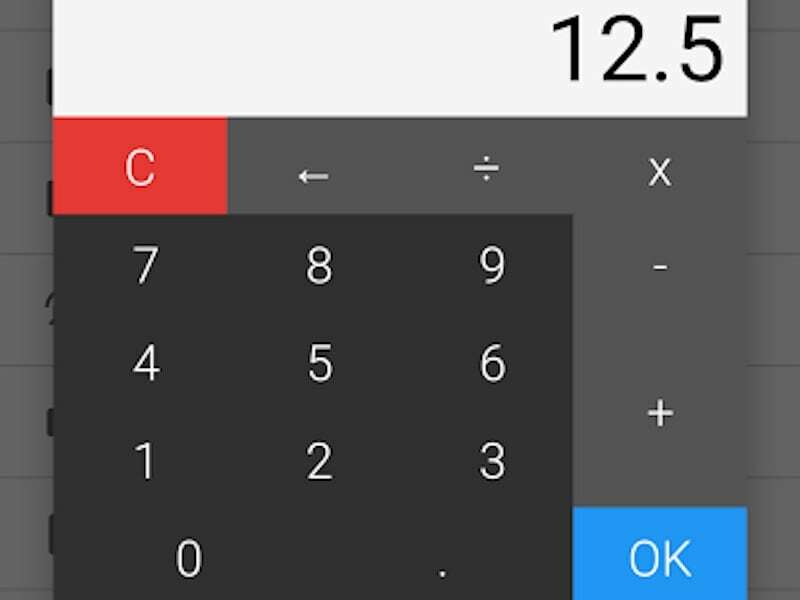 Just tap a button, enter the amount, add a label, and it's done. Many other apps are like that but Bluecoins stands out because simplicity doesn't come at the cost of functionality. The app actually shows a very detailed demo mode on first run, where the app has already been filled out with a lot of data. This way, you can explore the different features such as the summary, reminders, balance sheet, and so forth. It also asks for a default currency, which can later be changed in settings. The first thing to do is add accounts - things like cash in hand, bank balance, and so on. This is all done manually so I just entered in the details, and then once I started spending it became easy to track how much money was still available, and where. Like we mentioned before, adding expenses as they happen is quite straightforward. There's a big '+' sign at the bottom right corner of the screen. To add an expense, just tap that and then enter a name, and the amount, and then add the category, and where you're paying from. This is all pretty easy to do and you can also attach a photo of the bill at this point. When entering the amount, the app also shows a handy calculator view - so if you want to put different cab bills together in a single entry, for example, you could just total them up directly at this point. On the right, the currency is shown in a big button. Tapping that changes the currency for each transaction - so although my default currency is rupees, I can change it to dollars to match my spending, instead of having to do any conversions. In the settings you can mark it to remember the last currency used, which I've turned on, or you can have it switch to your default for every new transaction if you prefer. There's also a travel mode - this assigns the travel label by default to all new transactions. What's the benefit of this? If I had already been using Bluecoins at home, ahead of my travel, then I would have found this handy. The way it works is to create a special label for when you're traveling, and then it automatically applies that label to all new entries. Then, if you want to see the money you've spent while travelling, you can just check by the label, rather than having to manually track entries. 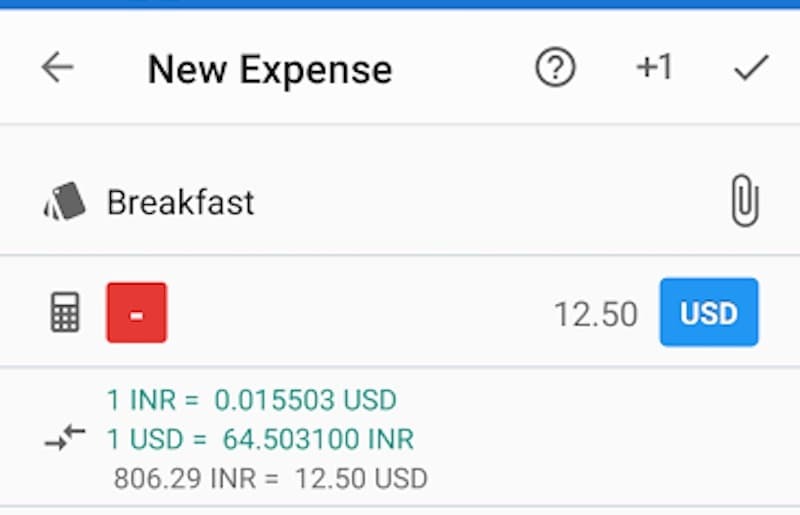 Bluecoins automatically shows the latest exchange rate, so I can see the amount I just spent in dollars, along with the rupee equivalent right away. This feature works offline, but it needs to connect to the Internet periodically to update the conversion rate. All of this is possible using the free version of the app. Extra features can be unlocked via an in-app purchase for $6.49, or Rs. 418.85 in India, which I didn't find necessary for my usage. The free version is limited to 13 accounts and 30 categories of spending, but since I'm currently using this only for travel, didn't come anywhere near hitting those limits. The other big advantage that the paid version has is SMS banking notifications - so it can automatically record transactions and offer bill reminders with notifications for due bills and credit card payments. The paid version is also ad-free, but the ads in the free version are pretty discreet and they didn't bother me.